Los Angeles based Able Freight Services Inc., expert in air and ocean freight covering 50 main perishables destination countries, will be introducing some innovations in its portfolio during Fruit Logistica in Berlin. Managing Director Gary Bull shared the company’s technology and innovation strategy with Fructidor. At Fruit Logistica Able will reveal one of its most exciting projects, a new customer portal called “DataHub”. DataHub is a web and mobile-based platform which generates real-time data, status updates, shipping documents and quality pictures pertaining to any shipment a customer has going through Able Freight Services. 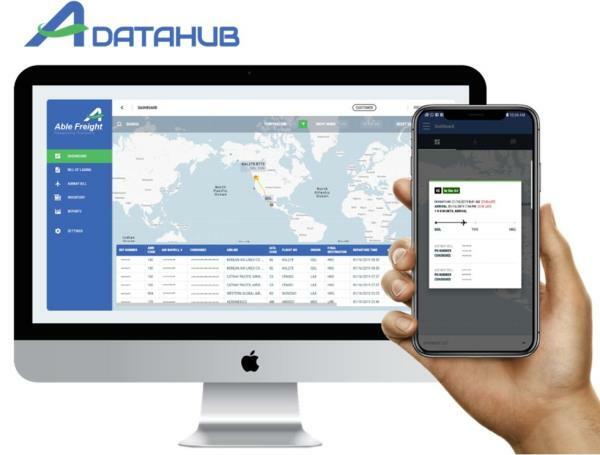 The DataHub platform provides real-time visibility of the temperature, humidity, and positioning of the cargo, all crucial data points, any fluctuations of that data in-transit, and all of the related documents to a customer’s shipment (Airway Bills, Bills of Lading, Invoices, Quality Checks, and Proof of Delivery). DataHub allows for streamlined digital documentation and more efficient communications, while enabling better informed and more proactive decision-making. “The web version of DataHub is already in use and in 2019 we just launched the mobile version. It is now active and available for Android and Apple (ios) users. It offers true end to end visibility in real-time including warehousing, airfreight, ocean freight and temperature trackers (upcoming: inbound and delivery trucks)” - explains Mr. Bull. Another exciting initiative in Able’s technology & innovation portfolio is called “Freshport”, a creative solution to bringing visibility and transparency to the dynamic shelf-life of any given commodity while being transported within the supply chain. Freshport is backed by Able’s proprietary shelf-life formulas and is currently piloting a Blockchain enhancement to the DataHub platform for its global clientele. Gary Bull shares that Able also recently implemented a new mobile-based Quality Control tool which resulted in improved reporting of the product’s quality on DataHub as received in real-time. To learn more visit Able Freight Services, Inc. at Fruit Logistica (Berlin, 6-8 February), Hall 23/ Stand C-02. About Able Freight Services, Inc.